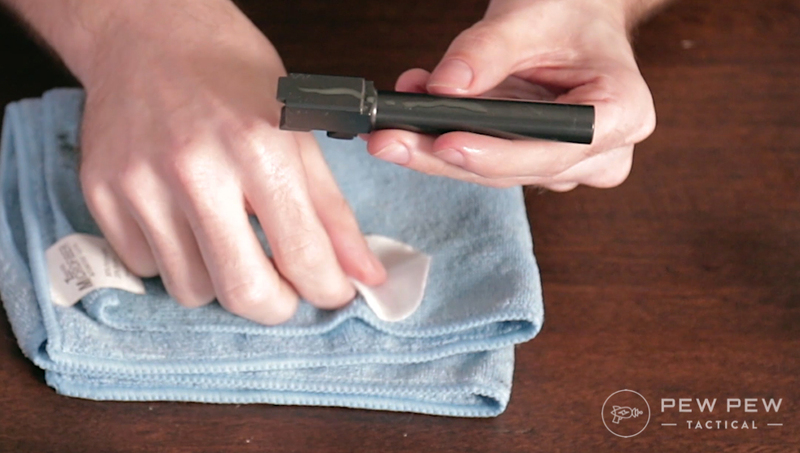 Cleaning your Glock is super easy and simple! Everything from the tools you need to how often you should be doing it, we’ll take you step-by-step through the whole process. And also how to detail strip it for when it gets really dirty. If that helped, please subscribe to our YouTube channel since we’re adding new videos every week! A Glock is the AK-47 of pistols…it will keep on chugging no matter what you throw at it. But for us, we still field strip and at least wipe down after each range session. After about 1,000 rounds, we will do a detailed strip. Of course, you should also clean your gun anytime you see a major shift in accuracy or if something happens, like dropping it in the mud or spending a day in the rain or dust. Field stripping just means disassembling a gun into its major components for routine cleaning and maintenance. It’s super easy on the Glock since it breaks down into four main parts in a matter of seconds. 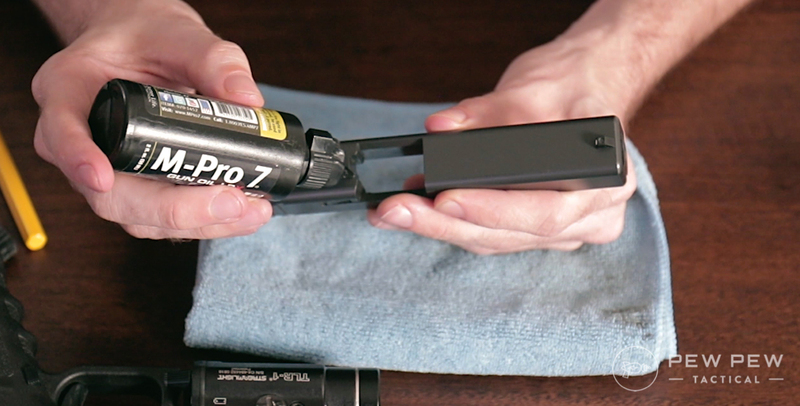 We recommend the following tools for cleaning our Glocks and other guns, conveniently all of these tools, cleaners, and lube is found in the M-Pro 7 Cleaning Kit. 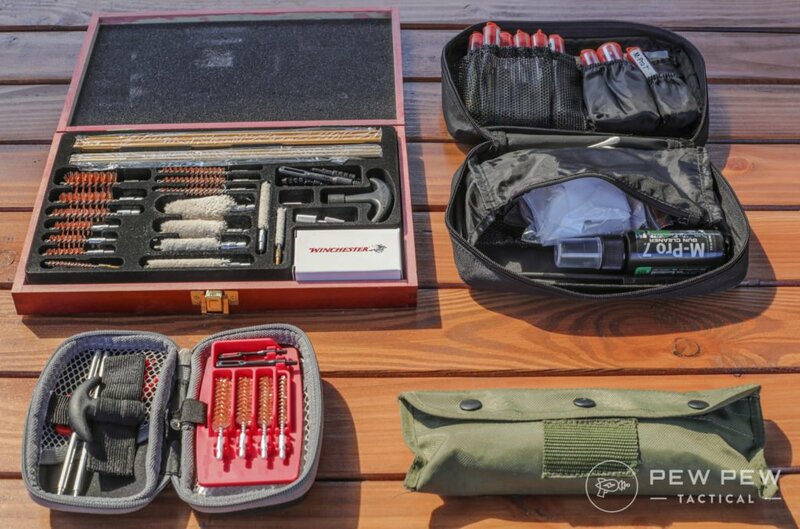 If you want some more great gun cleaning options, take a look at our 4 Best Gun Cleaning Kits! Now that you have your tools, find a decent place to work – a counter, table, or workbench all work great. Ensure any and all ammunition is removed from the area before you start cleaning your firearm! I like to lay down a towel or neoprene mat to soak up any spilled solvents and to catch the carbon, copper, and gunk that is cleaned from the weapon. 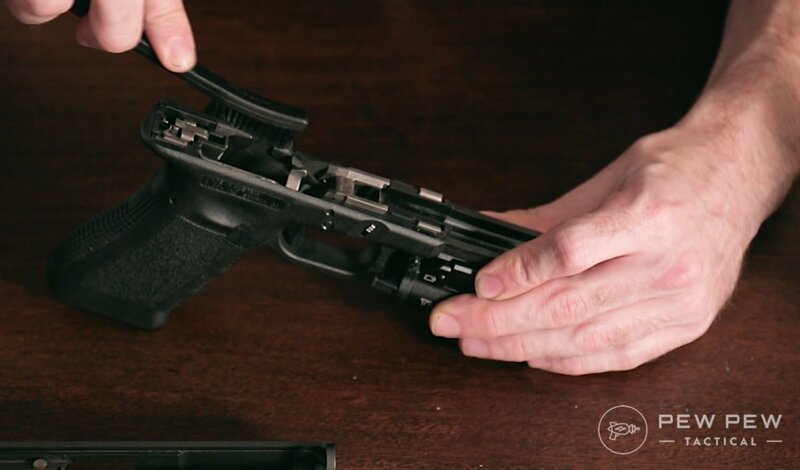 Before we strip, make sure your Glock is clear of any ammo – remove the magazine, rack the slide several times, then visually and tactilely (use your finger) to make absolutely sure the chamber is clear and your Glock is unloaded. Feel the chamber to make sure it is clear. Point your Glock in a safe direction and pull the trigger to dry fire it, once you hear the click – you’re ready to field strip. See the tab? Both of John’s index fingers are pointing to it. Easy! Once you pull down on the tabs, allow the slide to move forward and slip off of the frame. From here it is very simple to break down your Glock into it’s four main parts: Barrel, Frame, Slide, and Recoil Spring & Guide Rod. 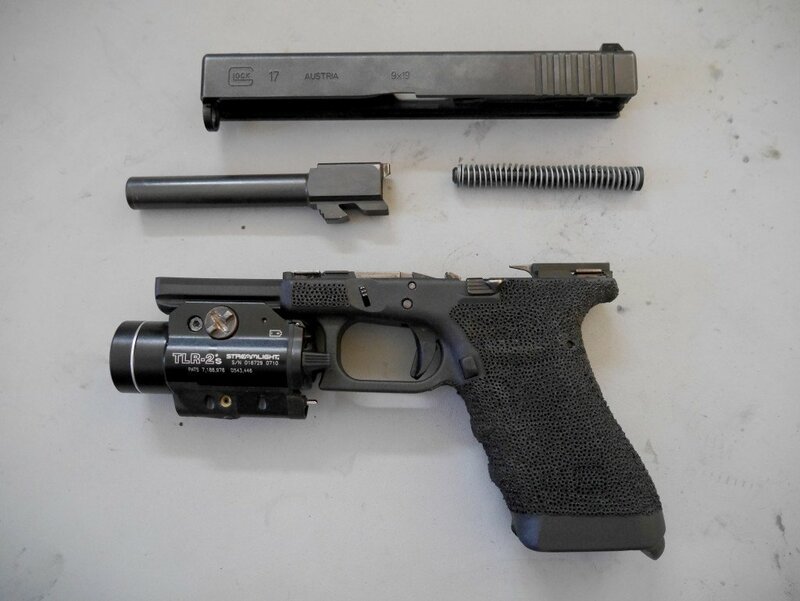 Glock 17 Field Striped: (top) Slide, (middle-left) Barrel, (middle-right) Guide Rod & Recoil Spring, (bottom) Frame. The barrel of your Glock is where the VAST majority of the dirt, carbon, and grim will hide – so that is what you want to clean first. Start with using a dry brush to push most of the crud out of your barrel. Make sure to always push the brush forward from the chamber to the muzzle. Run your brush back and forth at least 5 to 8 times or until you stop getting chunks of stuff. 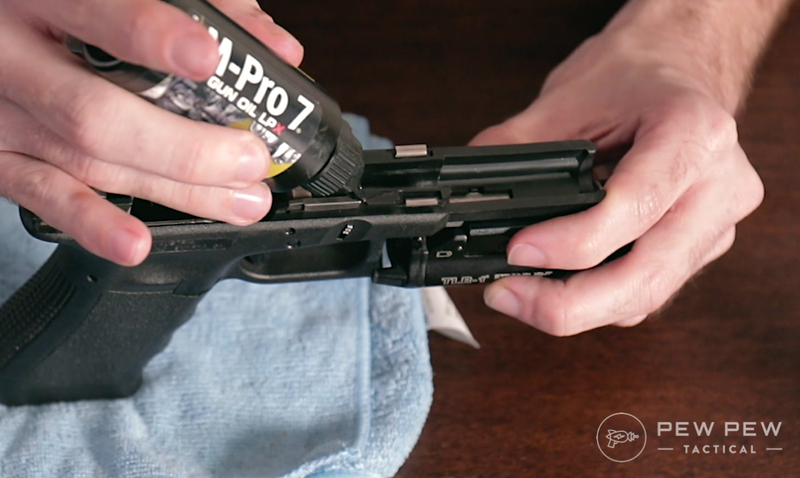 Next, take a gun cleaning patch and spray (or dribble, depending on what you’re using) some of your gun cleaner onto the patch – in our case, using the M-Pro 7 Gun Cleaner. 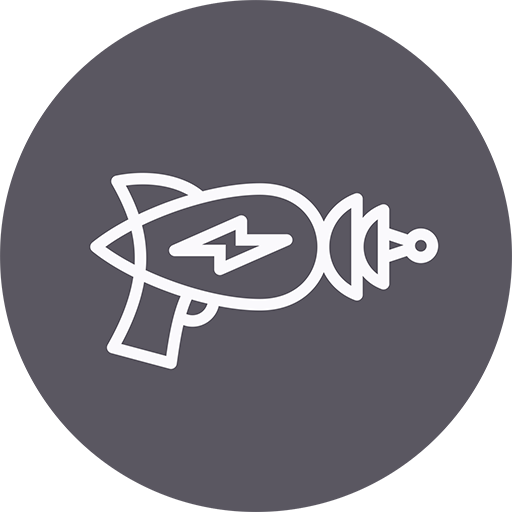 Repeat by running the patch through your barrel from chamber to muzzle 7 to 10 times. Take a clean patch and spray some cleaner on it, use that patch to just wipe down the outside of the barrel and to clean the feed ramps of the chamber – the feed ramps are the important part! See the ramp at the bottom of the barrel? That part is important! Clean it! Once the barrel is all shiny, inside and out, take a microfiber towel and wipe down the outside of the barrel to remove any excess cleaner, follow that by running some dry cleaning patches through the barrel until they start coming out clean the other end – this might take a couple of dry patches to accomplish. Look down the barrel and visually check to make sure all the fowling has been removed, if you see a couple of stubborn dark spots – don’t sweat it and don’t go crazy trying to remove them. But for the most part, the barrel should be shiny and uniform. Once clean, put your barrel aside and clean the slide! 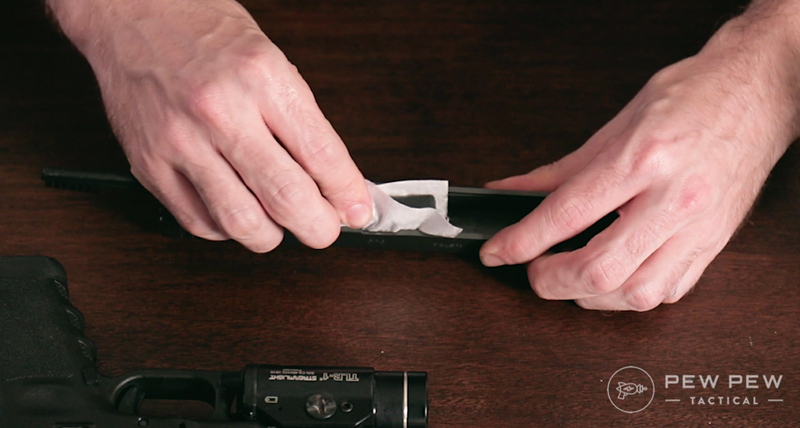 Take a brush and wrap the bristles with a gun cleaning patch, using that scrub/wipe down the inside of the slide focusing on the rear – this is where the important parts of the slide are and are where fowling will likely build up. 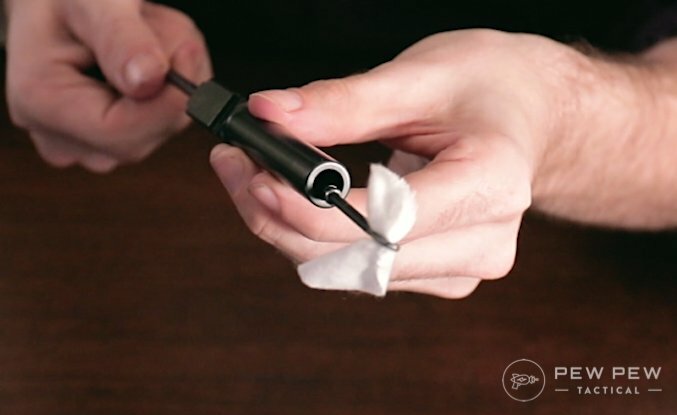 Wrap your brush, helps make your brushes last longer! You’ll want to make sure you get the inside of the rails as well, this might require using a Q-Tip to really get in there. While not always required, taking the time to do the details now will ensure your Glock never malfunctions due to poor maintenance. Clean the rails, clean ’em good! Take the slide and point the muzzle end down toward the floor, using the brush clean the breech face – be sure to not tilt the slide around too much while doing this, the goal is to keep the fowling away from the rear of the slide and to knock it away from the breech face. Muzzle down, clean the breech face. 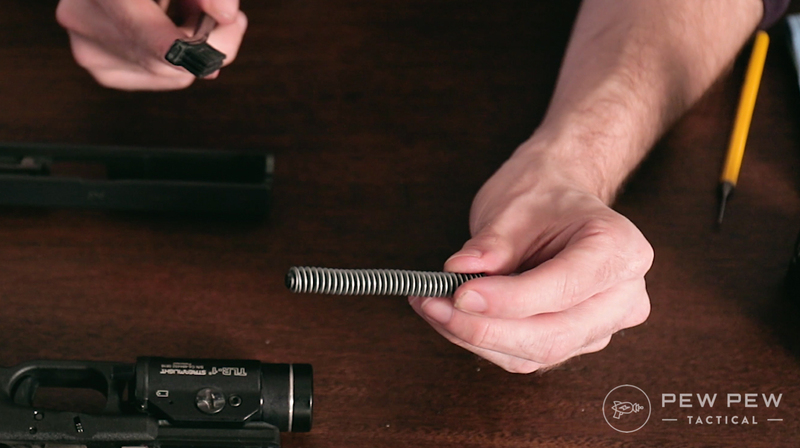 Brushing down the recoil spring and guide rod is easy, just take the brush and…brush it. Once done, wipe it down using a towel or rag. Brush the recoil spring and guide rod. The hard parts are over now! Cleaning the frame might look like a lot of nooks and crannies, but really it just needs a good scrub and wipe down. Take a brush and scrub the top of the frame, focus on the slide rails in the front and the trigger bar in the back. Clean the rails with cleaner if needed. If fowling is really built up on your slide rails, you may need to take a patch and cleaner to it. Don’t be scared to give it a really good scrub down. Don’t forget to use a towel or rag to wipe off the cleaner after! Magazines are often forgotten when it comes to cleaning and truth be told, they very rarely need it. And most of the time that they do need it, it’s because they were dropped in mud or dirt and a hose can normally take care of that type of cleaning. But at least once in a while, it’s a good idea to disassemble your mags and give them the cleaning they deserve. 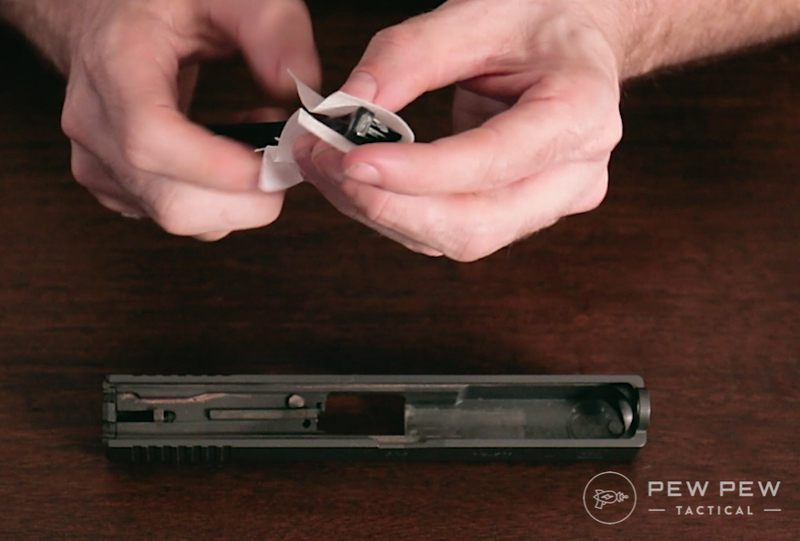 Remove the base plate of your magazine using the Glock Disassembly Tool or a punch. Be careful and make sure that while removing the plate you keep your thumb over the exposed spring to prevent it from flying across the room once the plate is removed. 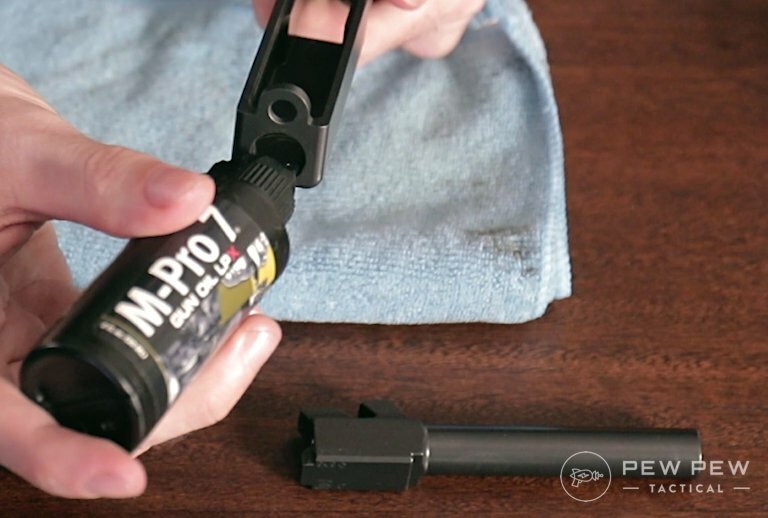 Once disassembled – simply take your brush and scrub down the inside and outside of the magazine, brush and wipe down the spring, and scrub the follower. 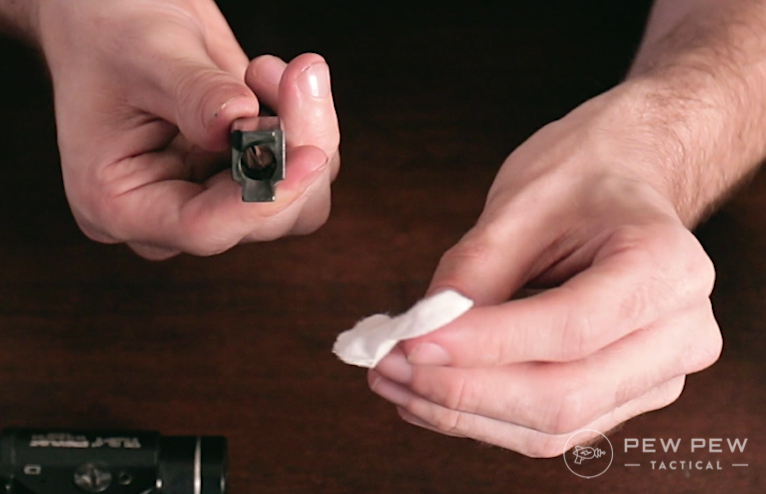 If you’re feeling really detailed – go ahead and wipe down the baseplate and insert. To reassemble you’ll want to first make sure that you replace the follower on the correct end of the spring (the small end!). Follower goes on the SMALL END of the magazine spring! Then just push the spring back in, insert the retaining insert, and close it up by sliding the baseplate back into place. Repeat after me: Less is more. Some people like to gun their firearms “wet” and while some guns truly need that, a Glock is not one of them. In fact, excess lubricate can hinder reliability as it holds on to more filth and grime. So, less is more. A light coating of lube is all you need on any of the parts. Start with the barrel – apply some lubricant to a cleaning patch and run it through your barrel using the same chamber to muzzle method 4 or 5 times – you might pick up some last bits of fowling doing this, feel free to ignore it. Follow that with a dry patch to remove the extra lube. Next comes the outside of the barrel, just apply some lube to the barrel itself and use a patch to wipe it across the entire outside surface. Oil the barrel – see, less is more! 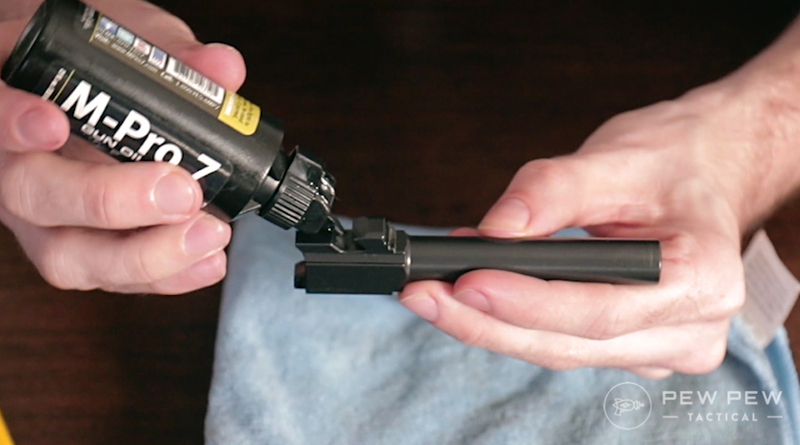 And you guessed it, use your towel to wipe down the barrel to remove excess lube! Then, once again, wipe up the excess with your towel. And on the front of the slide where the barrel will poke through – you’ll likely see some wear marks, that tells you where you need to lube. 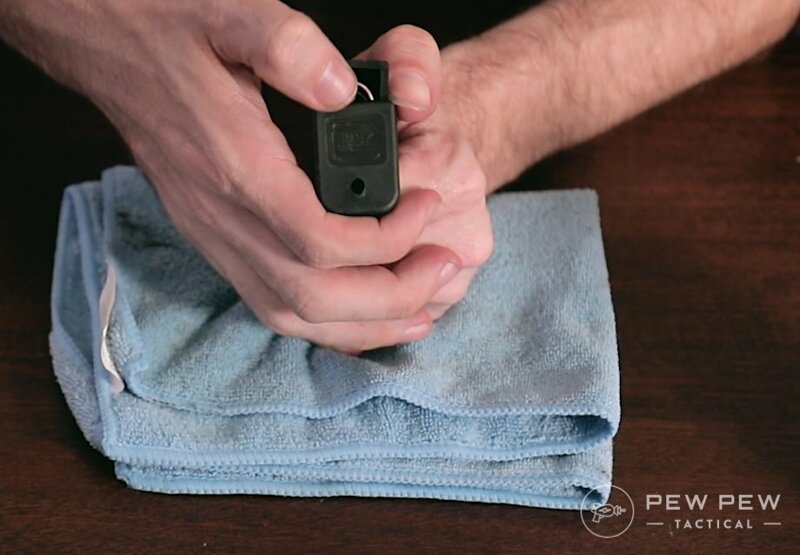 Wipe up the excess lube before moving on to the inside of the slide. Just a touch of lube on the slide rails, 1 drop per side. 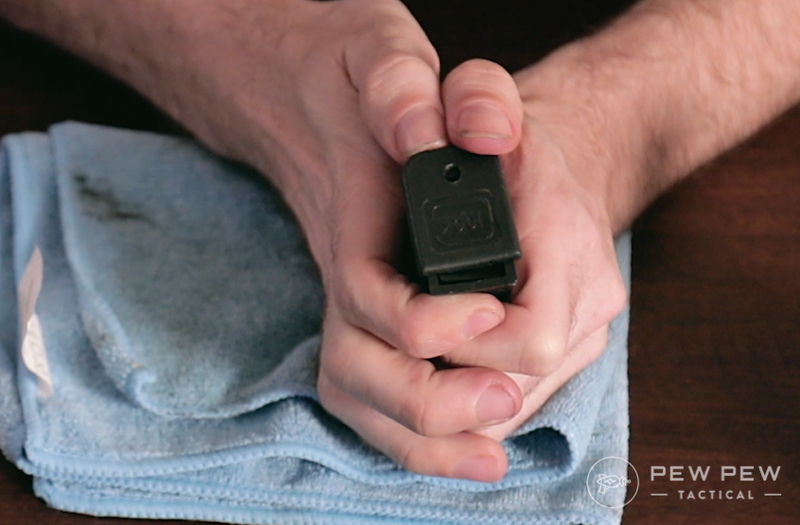 You’ll want to use your finger or a patch to wipe it down and spread the lube around evenly. Annnd again, remove excess with towel. You may have heard this before – lube the slide rails! Also, add a bit of lube to the raised metal part in the rear of the frame that interfaces with the trigger bar. Wipe off excess one last time and you’re done! To assemble, insert your barrel, guide rod & recoil spring back into the slide and slide the slide back onto the frame. 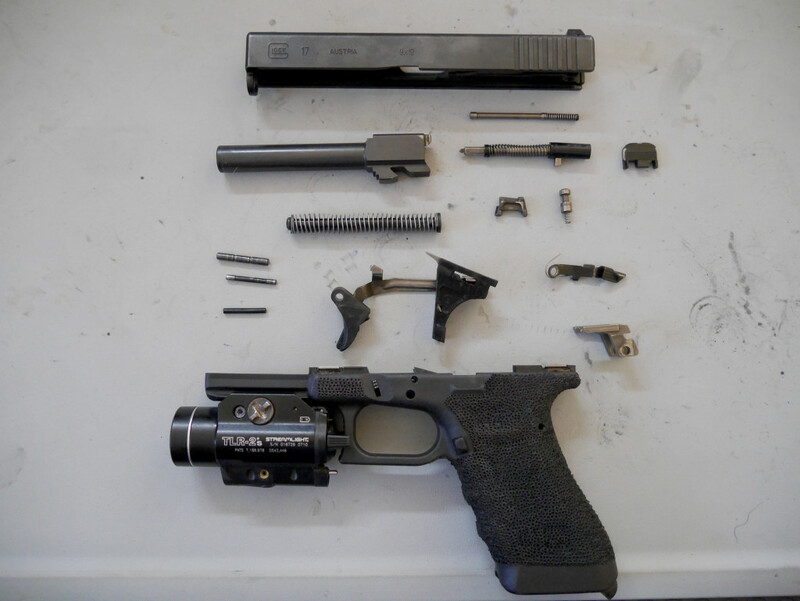 Assemble your Glock once all the parts are clean and lubed! FINALLY, point your gun in a safe direction and dry fire your weapon, rack the slide and dry fire again. Confirm that your weapon is functioning, your trigger is resetting as expected, and that nothing is gritty or out of place. That’s it! You’re done. Congratulations on a clean and well-maintained firearm. 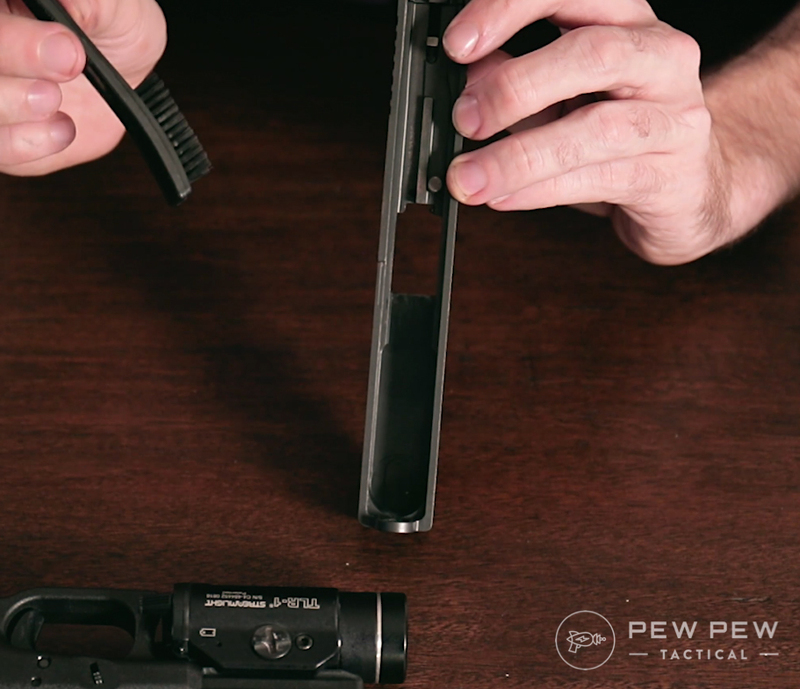 A simple Glock Disassembly Tool makes everything easier for the detailed strip. 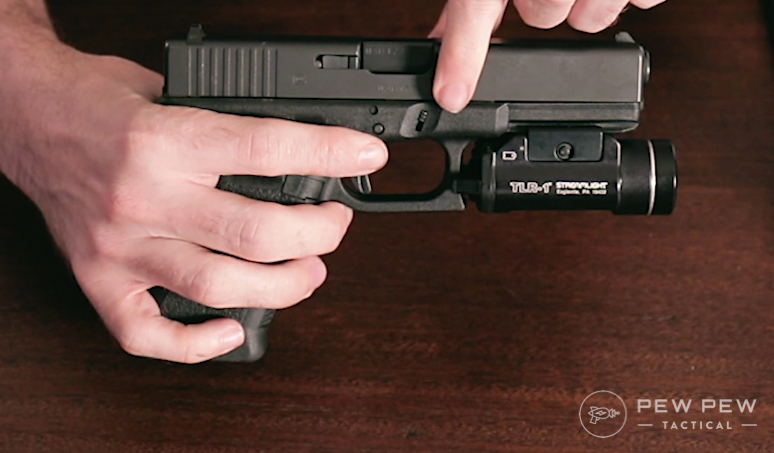 This great video below goes into how to fully strip down the Glock. Pay special attention to the removal and assembly of the pins, since there is a correct order. 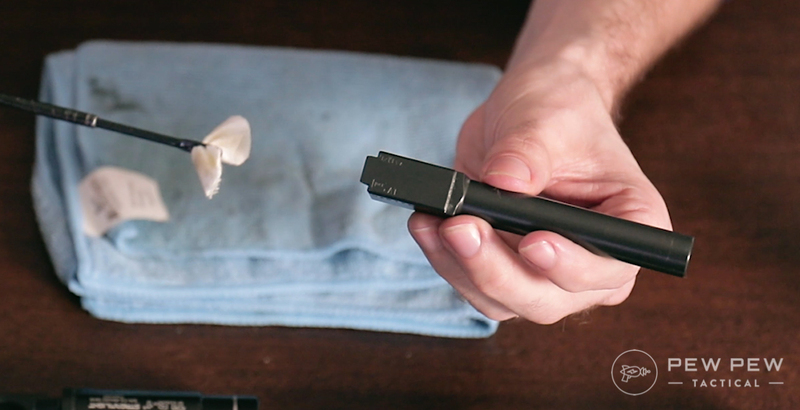 We clean everything with our M-Pro 7 and oil the moving parts. Cleaning your firearms is an important part of shooting, it keeps them running, it preserves them, and it’s relaxing to do. While the Glock is legendary for reliability and ease of maintenance, it’s still a good idea to clean it regularly. 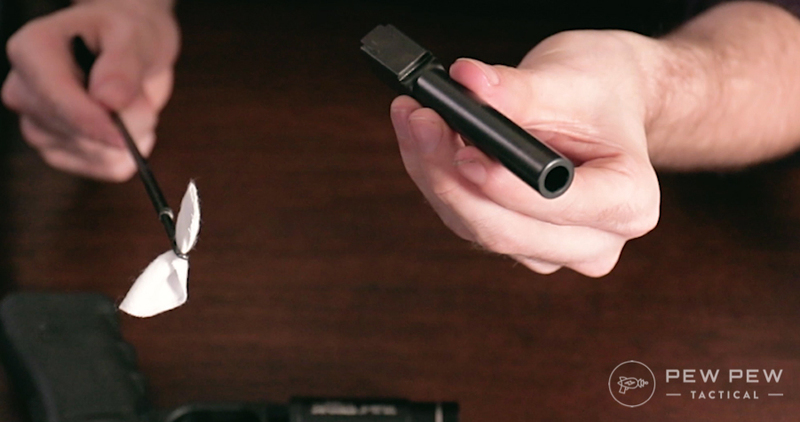 Now that you’re more familiar with the inside of your Glock, maybe it’s time to make some upgrades to it! 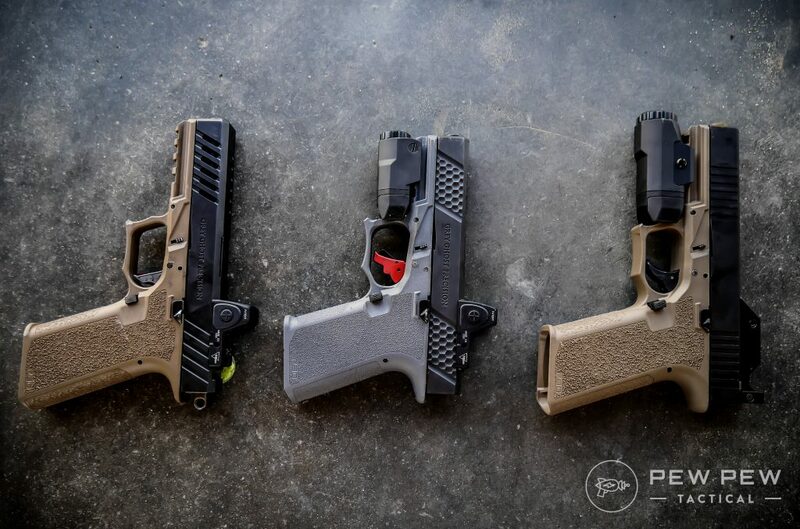 Take a look at our Best Glock Upgrades & Add-ons guide. 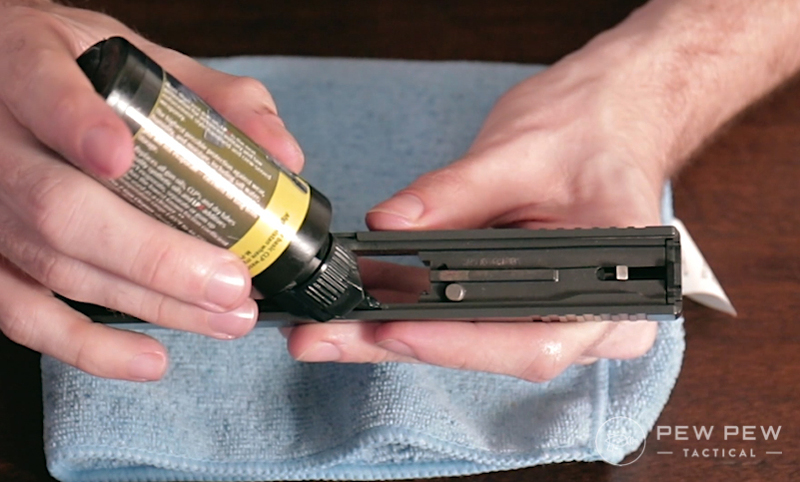 How often do you clean your Glock? Let us know in the comments! David is an Editor for PewPewTactical! Learning how to shoot at a young age in the Boy Scouts, he now spends most of his time working on or with firearms. Be it shooting, upgrading, building, tinkering, or writing about them - sharing his passion and knowledge of firearms with others is an everyday occurrence. Just a mechanical question: What would happen if you chambered a round, held the disassembly tabs down, and fired? I realize that it’s extremely dangerous, and of course I’d never attempt it. 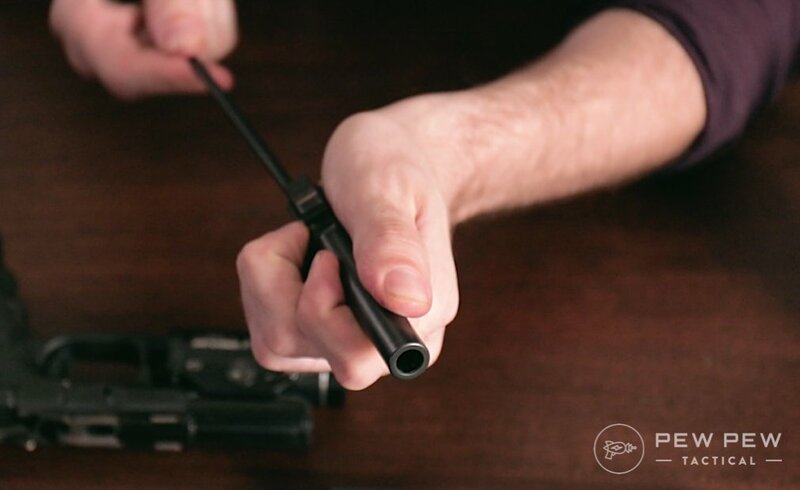 We check and clear every firearm we film with multiple times before it ever gets on camera. New to guns? 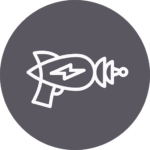 Check out our online Beginner Handgun Course that teaches all the important stuff you need to know. Get Our Top Shooting Drills and Zeroing Targets ($47 value - but FREE for a limited time). By clicking "Get it Now!" you will be automatically subscribed to our newsletter. I may earn a small part of the sale from links to any products or services on this site. You do not pay anything extra and your purchase helps support my work in bringing you more awesome gun and gear articles. Copyright © 2019 Pew Pew Media, Inc. All rights reserved.